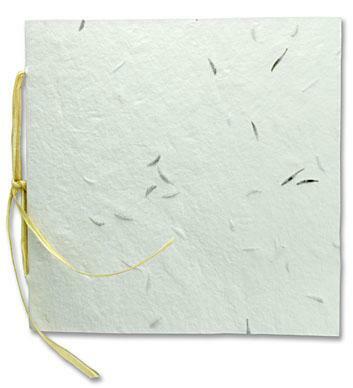 Plantable Wedding Program with WILD FLOWER seeds embedded into handmade cotton rag paper. BEE-friendly, perfect for a Green Wedding. Wild flower seed mix includes: Black-eyed Susan, Sweet Alyssum, Spurred Snapdragon, Birdâ€™s Eye, Baby's Breath. Mix chosen to support Bee Colonies. Treefree and pcw recycled papers for a Green Wedding. Very natural looking, very tactile feel. Plantable! Booklet style wedding program. Cover made from heavyweight cotton rag handmade paper. WILD FLOWER seeds are imbedded in the paper. Thick and textured, a really handsome paper. Two interior sheets of 100% postconsumer recycled paper for printing your order of ceremony. Colors: Softwhite ivory handmade paper cover, and light hay colored printing paper, matching paper raffia. Program Cover: Plantable Textured Cotton Rag handmade paper embedded with Wild Flower Seeds.DIECUT and Scored. Printing Sheet: Two sheets of 5.5x11 70lb 100% post consumer recycled paper. Light hay colored. Very handsome.